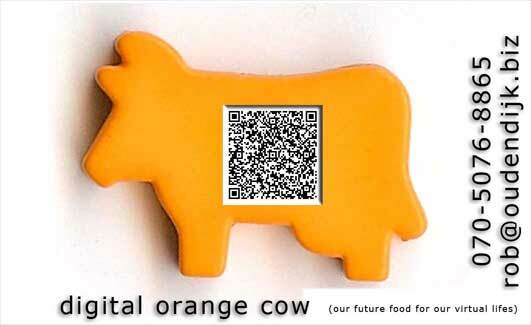 new meishi design based on the orange cow with an QR code in it’s body to let us look into it’s stomach.let us look into the future. a future that propally will be virtual.the signs of it is already beginning with children playing games like their second life and adults creating their own life virual in “second life“. At La Droguerie I came across a button that did strike me as typical Dutch. I tried it with “crazy glue” on my ear to see if it fitted. It did, so I used the design for creating an earing and some add ons on my cloths. Orange as a color often associated with Holland. Due to the ruling family in Holland use to be the “van Oranje” family. The cow as a common dutch animal, living on the green grasslands. The “cow of orange” could be a nickname being used in the Spanish war in Holland.